At Ohio Identification Solutions we offer a wide variety of high quality thermal transfer labels at competitive discount prices. Our thermal transfer labels are made from the highest quality materials available in the pressure sensitive label industry. Our thermal transfer labels are available for all brand name thermal label printers. Thermal transfer labels require the use of thermal transfer ribbons and have a longer shelf life than Direct Thermal Labels. If you are seeking labels that do not require a thermal ribbon, then please visit our page on Direct Thermal Labels. The most common application for thermal transfer labels are carton labeling for shipping. Thermal transfer labels can also be used in applications such as product labeling, shelf labeling, pallet labeling, rack labeling and UPC labeling. If you have a question about how thermal transfer labels will work in your application, please do not hesitate to contact us. Our thermal transfer labels are available in both rolls and fan-folded packs. 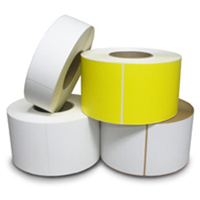 Rolls of thermal transfer labels are wound onto durable high quality 1" or 3" cardboard cores. The thermal transfer label rolls are available with outside diameters of 4, 5, 8 and 12 inches. All thermal transfer label materials are available in popular industry standard label sizes. We offer a variety of adhesive systems for thermal transfer labels including permanent, removable and freezer grade to fit any application. Our thermal transfer labels can be flood coated with a large selection of colors from the Pantone chart and several common colors are stock in several stock sizes. Custom flood coated labels are available as well. Thermal transfer labels can be ordered from a large variety of standard stock label sizes or we can make custom label sizes for your application. We highly recommend that you test all thermal transfer labels in the end use application before purchasing. Sample thermal transfer labels are usually available at no charge upon request. Click here to request FREE samples of our thermal transfer labels.